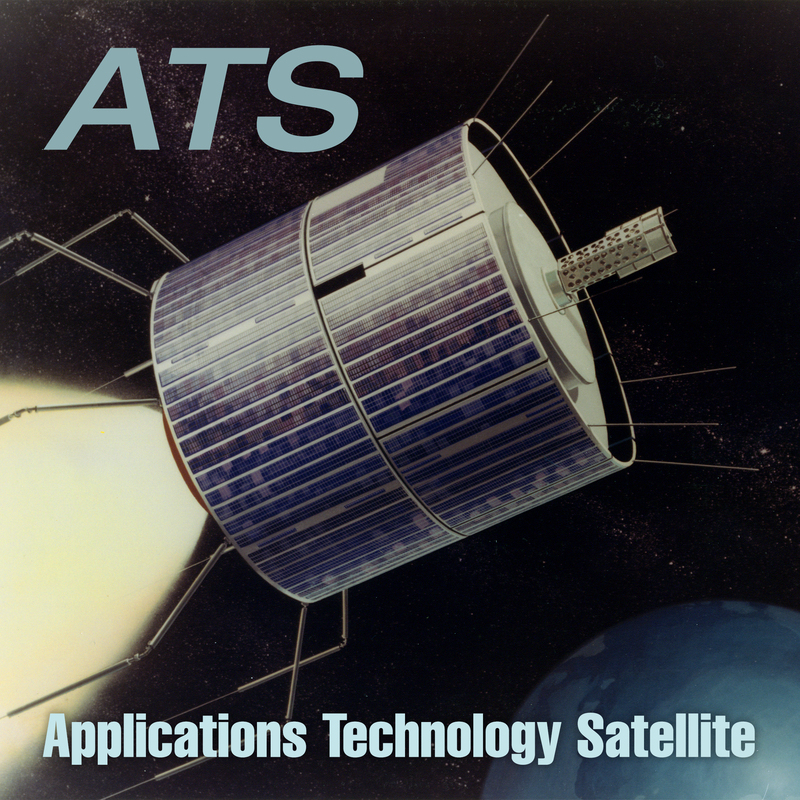 The Applications Technology Satellite (ATS) series was conceived of as a follow-on to the successful experimental communications satellites of the early 1960's with the addition of other technology demonstrations, such as weather observation and investigation of the space environment. NASA and Hughes had hoped to continue the success of the Syncom project with an Advanced Syncom. They met resistance from some members of Congress who feared that NASA was developing technology for the benefit of a private company, namely Comsat. So the project's objectives were broadened and it became ATS. The Department of Defense (DoD) influenced NASA to include technology for gravity-gradient stabilization (on ATS-2, ATS-4, and ATS-5) and for medium altitude orbits (ATS-2). All five of the first generation ATS spacecraft carried a C-band transponder with 25 MHz bandwidth capable of relaying 1200 one-way voice circuits or one color television signal. The ATS 1 spacecraft shows its Syncom heritage, but at 351.5 kg (775 lb) on-orbit, with a length of 1.5 m (54 inches), was a larger and a much more capable satellite than its predecessor. In addition to a C-band transponder, ATS-1 carried a VHF experiment for communications with aircraft, ships, meteorological remote terminals, and to evaluate VHF satellite navigation. It used an eight-element phased array antenna with a 5 Watt transmitter for each element. The spacecraft was spin stabilized and had solar cells mounted around the barrel shaped body to provide 175 Watts of electrical power. ATS-1 was the first satellite to use frequency division multiple access (FDMA) taking independently uplinked signals and converting them for downlink on a single carrier. This conserves uplink spectrum and also provides efficient power utilization on the downlink. ATS-1 also carried a black-and-white weather camera which transmitted the first full-disk Earth images from GEO. ATS-1 objectives were to test the experimental geostationary techniques of satellite orbit and motion, measure the orbital environment at 23,000 miles above the Earth's surface, and transmit meteorological information (imagery and data) to surface ground stations. The spacecraft was a cylinder 56 inches in diameter, 57 inches high and weighed 750 pounds. A phased array of eight whip antennas extended from the top, and a phased array of eight VHF antennas extended from the base. The sides of the cylinder were covered by 23,870 solar cells which, along with nicad batteries, provided the power for the craft. Two meteorological experiments were on board. One was a spin scan cloud camera which provided continuous, full-disk hemispheric images of the Sun-lit Earth every half hour. The spinning motion of the satellite generated line scans with a spatial resolution of 3.2 kilometers. This process took approximately 20 minutes for the full image, and then 10 minutes to reset the camera for a new image. The second experiment was Weather Facsimile (WEFAX), a data relay and re-transmission instrument. This instrument relayed data from the central ESSA data processing facility to APT ground stations located around the western hemisphere. ATS-1 was placed in a transfer orbit directly over the equator over Ecuador. The transfer orbit meant that the satellite would drift slowly westward with time. The satellite eventually reached 151 degrees west (just east of Christmas Island) where it was deactivated on December 1,1978. Of the satellite's 12-year life span, useful data was received for the first 6 (1966-1972). One of the spectacular and promising events during 1966 was the successful operation of the ATS-I spin-scan camera. This camera is providing the first high-quality cloud-cover pictures taken from an equatorial synchronous satellite. These pictures show the disk of the Earth between 52 deg. Latitude N. And S. With a resolution approaching 3 km. The camera system can take the disk pictures once every 20 minutes and smaller areas more frequently, affording a potential continuous watch of global weather patterns. Another meteorological experiment on ATS-I transmits meteorological data (weather maps, cloud analyses, and spin-scan cloud pictures) from the ATS ground station at Mojave, California, via the satellite's VHF transponder, to APT ground readout stations in the United States, Canada, Japan, Australia, and islands in the Pacific. ATS-1 was launched December 7, 1966 and carried out an impressive array of experiments in communications and in collecting weather data. The communications hardware was still functioning nearly 20 years later when the spacecraft did not respond as intended to commands in 1985 and it slipped into a useless orbit. Applications Technology Satellite-2 objectives were to test the experimental geostationary techniques of satellite orbit and motion; measure the orbital environment at 23,000 miles above the Earth's surface; transmit meteorological information (imagery and data) to surface ground stations. The spacecraft failed to reach its intended orbit and was deactivated after the second stage of the Atlas rocket failed. The objectives of the ATS-3 satellite was to develop the experimental geostationary techniques of satellite orbit and motion, measure the orbital environment at 23,000 miles above the Earth's surface, and transmit meteorological information (imagery and data) to surface ground stations. Slightly larger than ATS-1, ATS-3 was a cylinder 60 inches in diameter, 72 inches high and weighed 805 pounds. A phased array of eight whip antennas extended from the top, and a phased array of eight VHF antennas extended from the base. The sides of the cylinder were covered by 23,870 solar cells which, along with nicad batteries, provided the power for the craft. Three meteorological experiments were on board. One was a spin scan cloud camera which provided continuous, full-disk hemispheric images of the Sun-lit Earth every half hour. This camera was modified to produce color images. The spinning motion of the satellite generated line scans with a spatial resolution of 3.2 kilometers. This process took approximately 20 minutes for the full image, and then 10 minutes to reset the camera for a new image. The second experiment was an Image Dissector Camera which scanned the full-disk electronically rather than mechanically. The third experiment was Weather Facsimile (WEFAX), a data relay and re-transmission instrument. This instrument relayed data from the central ESSA data processing facility to APT ground stations located around the western hemisphere. In addition, images from the spin scan camera were also transmitted over WEFAX to APT stations. ATS-3 was placed in a transfer orbit directly over the equator over 45 degrees west (ATS-1 was over the eastern Pacific at this time). The transfer orbit meant that the satellite would drift slowly westward with time. The satellite eventually reached 95 degrees west where it was deactivated with ATS-1 on December 1, 1978. Of the satellite's 11-year life span, useful data was received for the first 8 (1967-1975). The ATS-4 was launched to evaluate gravity-gradient stabilization and new imaging techniques for meteorological data retrieval. The spacecraft was deactivated after 61 minutes when the Centaur rocket failed to ignite. The satellite's orbit was too low and the resulting atmospheric drag caused it to re-enter the Earth's atmosphere. Although the spacecraft was not stable, due to this low orbit, NASA engineers successfully turned on several of the experiments to collect as much information as possible before the satellite broke apart on October 17, 1968. The objective of the ATS-5 satellite was to evaluate gravity-gradient stabilization and new imaging techniques for meteorological data retrieval. Shortly after separation, the spacecraft began to wobble, and although control was restored and the satellite reached its destination (over the equator west of Ecuador), the satellite was spinning in the wrong direction. Although some of the instrumentation on board functioned properly despite the wrong spin, the gravitational gradient and imagery acquisition experiments failed. WEFAX was still operational although no images were transmitted.